The European plan of immigration is now operationally active, as unveiled by the agreement signed on March 18, 2016 with Turkey, to control and stop irregular migration directed towards the EU. Nevertheless, these operations were not without criticism. It is an agreement that frees the European Union from the responsibility to solve the problem or it is another failure of the political European institutions? The Police of the island of Lesvos are making the refugees to embark on ships that every day will reach Turkey. According to the plan, only those migrants who have not applied for asylum or whose application was judged unacceptable are destined for returning back. The agreement also includes the opposite mechanism. For every Syrian refugees arrived in Europe through illegal ways, and was then dismissed in Turkey, it will be assured the settlement in Europe for who has legally arrived in Turkey, also entitling the right of international protection. The first group of refugees that has been reported in Turkey were mostly from Pakistan, Bangladesh and Morocco. The citizens of these nationalities are unlikely to be granted asylum in Europe and, although Brussels has expressly guaranteed that they have been informed them about the opportunity to submit a request, but this first group seems to have not submitted any application. The issue could be more problematic when to board on the boats towards the Turkish coasts as citizens of Syrian nationality. As matter of the fact, according to the particular clause of geographical limit in application of the Geneva Convention, asylum requests have to be treated in Europe and automatically judged inadmissible because the refugees have arrived in Europe after crossing another country, Though, Turkey, which ensures a low level of protection, Ankara has guaranteed the legal amendment which will assure protection to Syrians in line with the Convention, but no one knows when this might happen. At this moment, the European Commission have submitted two possible reforms of the asylum policy in Europe. Based on the "Dublin Principle", it is the country of first arrival to manage asylum applications and being called in question by the other member States, but as per the European Commission's proposed two possibilities of reform. The first is that "the current allocation criteria of asylum responsibility is confirmed, but pairing it with a structural emergency relocation mechanism of redistribution, to trigger under specific circumstances, when a member country is subject to a disproportionate pressure". The second possibility introduces "a new placement for the asylum seekers on the basis of a permanent key distribution mechanism". Now, it is time to wait for the opinion of the Twenty-eight States and, above all, that their leaders not to object the relocation of those who have advanced asylum request, arguing that the phenomenon of immigration is closely linked to the proliferation of terrorism, especially now that Frontex, the European agency in charge of cooperation of EU States at the EU borders, confirms with an assessment on the high risk of terrorist infiltration along the borders. A thin line separates the disastrous vision that some have about the European Union, which has submitted to the demands of Turkey and has entrusted the management of asylum to Ankara. Or the European Union has simply chosen a solution that frees the political European institutions and the Member States from their responsibility to accommodate the victims of war and jihadist terrorism. If immigration and terrorism go hand in hand, now it is important to understand that in details, if this problem get solved, the EU will be in more able position to guarantee to its citizens the high safety standards. 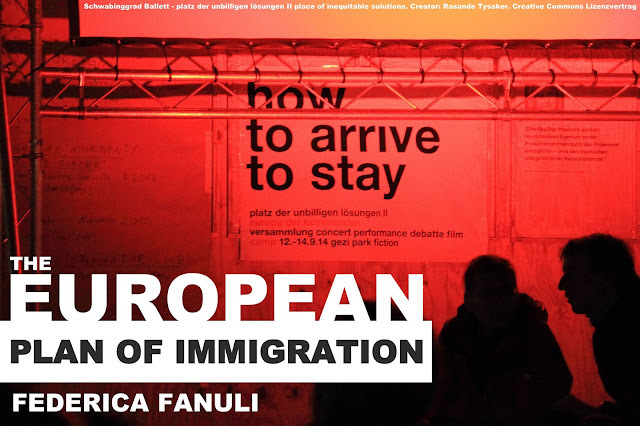 Federica Fanuli (TR RID : M-9093-2015) was graduated with honours in Political Science and International Relations from the University of Salento and she has obtained a Master's Degree in Political Science, European Studies and International Relations from the same university. As a Foreign Affairs analysts, she is an editorial board member of the Institute of Global Studies, a columnist at The Sunday Sentinel, an editorial board member of Cosmopolismedia.it and Editor-at-Large at IndraStra Global. She can be reached at her Linkedin Profile.